The second installment of our Winter Sports Series from Naturalist Chris! Winter is now fully upon us at Upham Woods. The temperatures have plummeted well below zero and over a foot of snow has fallen in the last week. This is perfect weather for cabin fever! In my first installment, I mentioned that the best way to enjoy the winter months is to stay active. In this article I will be introducing a new winter activity at Upham Woods, snowshoeing. The ancestor of the modern snowshoe first appeared in North America about 5000 years ago. They were made of natural materials such as rawhide webbing and frames made from the wood of ash and maple trees. The early designs varied in size shape across different geographic regions. For example, The Alaskan snowshoe was often six or seven feet long. The large size helped to spread out the wearer’s weight over deep snow, but they were hard to maneuver. In a nearly treeless landscape poor maneuverability is not a concern. However, in the dense forests of eastern North America a shorter, more maneuverable snowshoe was needed. The shorter and rounder Bearpaw and Green Mountain snowshoes do not provide as much flotation over the snow, but they are very easy to use in crowded landscapes. 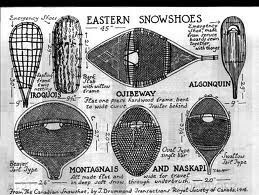 Modern snowshoes borrow design elements from traditional snowshoes, such as the upturned toe of the Alaskan, and the short length of the Bearpaw and Green Mountain. They are made of aluminum, plastic, and synthetic fabrics instead of natural materials. One key improvement has been the addition of metal spikes, called crampons, on the bottom of the snowshoe to provide traction on ice and hard packed snow. The biggest difference between traditional and modern snowshoes is the reason why they are worn. 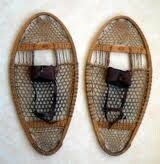 Snowshoes were invented to make it easier to travel when the snow was deep. They were a tool used to make daily life easier for the wearer. Modern snowshoes are used almost entirely for recreation. Using them allows for hiking in all trail conditions at times of the year when hiking would be very difficult. At Upham Woods we use modern snowshoeing equipment when we lead guests on snowshoeing hikes along the shores of the scenic Wisconsin River. At Upham Woods or on your own, snowshoeing is a rewarding winter experience and a great way to experience the outdoors!